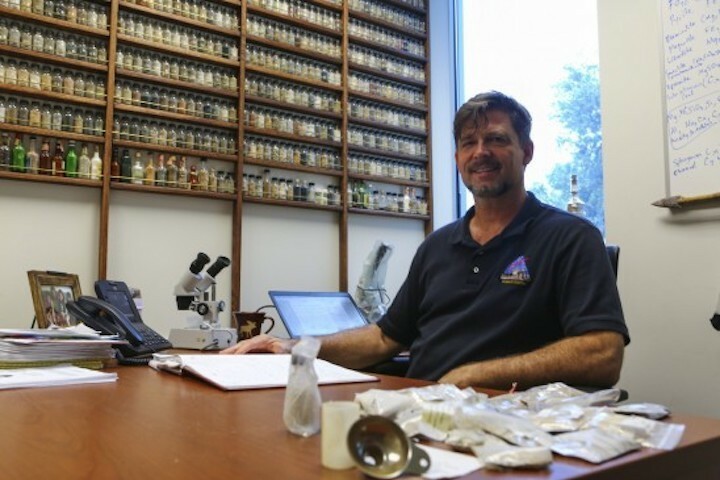 UCF’s Phil Metzger and Julie Brisset from the Florida Space Institute recently landed a contract to develop a model to mine the moon for water. Data suggests the moon has water locked away in its icy soil, especially at the moon’s poles. The challenge is finding an effective and inexpensive way to get it. Water is important because its chemical composition could be split into hydrogen and oxygen, which could then be made into rocket fuel. The ability to generate rocket fuel in space could open up more launch possibilities and reduce costs for transportation throughout lunar space and beyond. Metzger and Brisset aim to come up with a viable method to extract the water. The idea would be to drill holes deep into the moon and pump heat through the holes to warm the regolith underground, which has water locked in frigid ice chunks. As the regolith warms up, the water would be released as vapor and collected through pipes in the hole. Others have proposed having big equipment dig for the water and drag ice chunks to processing plants on the moon. But the proposed process may require equipment that has less mass and be more reliable than the wheeled digging equipment needed dig up piles of regolith and haul it to processing plants that would extract the water. By extracting the water in-place in the ground, there would be no need to move tons of soil around, Metzger said. Mining the moon is a focus of many researchers around the nation. But most are investigating techniques that collect and process the regolith of the moon rather than the ice. The regolith is the unconsolidated residual material that overlies the solid rock. The United Launch Alliance (ULA) has contracted the UCF duo to find out if their proposed method is realistic and cost effective. Those who can figure out a way to tap into water in space may be in a position to mine it and sell it for a variety of uses from life support systems and rocket fuel to radiation shielding and drinking water for space explorers. Metzger, a planetary physicist who worked at Kennedy Space Center where he co-founded KSC Swampworks before joining UCF, is leading the project. Brisset, a research associate at the institute who has multiple degrees in mechanical and space engineering as well as physics, will work on the algorithms to run the computer simulations they hope will lead to a viable model. They also plan to hire a student to help with the testing. The biggest challenge is a matter of geometry, Brisset said. The team already has data that indicates heating the moon’s underground is possible. But converting the lunar ice into vapor requires high temperatures and unfortunately most of the heat will travel away through the lunar soil and be wasted.